Generation of reduction equivalents is a prerequisite for nutrient-stimulated insulin secretion. Mitochondrial succinate dehydrogenase (SDH) fulfils a dual function with respect to mitochondrial energy supply: (1) the enzyme is part of mitochondrial respiratory chains; and (2) it catalyses oxidation of succinate to fumarate in the Krebs cycle. The aim of our study was to elucidate the significance of SDH for beta cell stimulus-secretion coupling (SSC). Mitochondrial variables, reactive oxygen species (ROS) and cytosolic Ca2+ concentration ([Ca2+]c) were measured by fluorescence techniques and insulin release by radioimmunoassay in islets or islet cells of C57Bl/6N mice. Inhibition of SDH with 3-nitropropionic acid (3-NPA) or monoethyl fumarate (MEF) reduced glucose-stimulated insulin secretion. Inhibition of the ATP-sensitive K+ channel (KATP channel) partly prevented this effect, whereas potentiation of antioxidant defence by superoxide dismutase mimetics (TEMPOL and mito-TEMPO) or by nuclear factor erythroid 2-related factor 2 (Nrf-2)-mediated upregulation of antioxidant enzymes (oltipraz, tert-butylhydroxyquinone) did not diminish the inhibitory influence of 3-NPA. Blocking SDH decreased glucose-stimulated increase in intracellular FADH2 concentration without alterations in NAD(P)H. In addition, 3-NPA and MEF drastically reduced glucose-induced hyperpolarisation of mitochondrial membrane potential, indicative of decreased ATP production. As a consequence, the glucose-stimulated rise in [Ca2+]c was significantly delayed and reduced. Acute application of 3-NPA interrupted glucose-driven oscillations of [Ca2+]c. 3-NPA per se did not elevate intracellular ROS, but instead prevented glucose-induced ROS accumulation. SDH is an important regulator of insulin secretion and ROS production. Inhibition of SDH interrupts membrane-potential-dependent SSC, pointing to a pivotal role of mitochondrial FAD/FADH2 homeostasis for the maintenance of glycaemic control. Nutrient-dependent activation of mitochondria is essential for physiological stimulation of insulin secretion. Succinate dehydrogenase (SDH), the catalytic subunit of complex II, adopts an exceptional position for mitochondrial regulation as this enzyme participates in both the Krebs cycle (tricarboxylic acid [TCA] cycle) and the respiratory chain. By SDH-dependent generation of reduction equivalents, metabolic flux via the TCA cycle is directly linked to oxidative phosphorylation. SDH catalyses the oxidation of succinate to fumarate, and the activity of the enzyme increases with a rise in intra-mitochondrial succinate concentration. This process is accompanied by production of FADH2. As expected, stimulation of beta cells with metabolic substrates that activate the TCA cycle (and thus complex II) is accompanied by a drop in FAD autofluorescence indicative of a shift in the balance of reduction equivalents to increased FADH2 concentration . SDH activity has been measured in homogenates of rat and mouse pancreatic islets [2, 3]. As its activity in islets is ~85% lower than that in liver or exocrine pancreatic tissue , it may represent one of the rate limiting steps of insulin secretion. Mutations of SDH have been linked to severe diseases, such as neuronal and neuroendocrine tumours [4, 5, 6]. For Huntington’s disease (HD), defects in complex II, III and IV of the respiratory chain have been shown in post-mortem studies . Decreased expression of the FAD-binding subunit and the iron-sulphur subunit of SDH has been found in striatal biopsies of HD patients . Changes in SDH have also been linked to diabetes. An influence of metabolic disorders on human SDH has been observed in muscle biopsies of patients with type 2 diabetes [9, 10]. These studies show reduced SDH activity in patients with type 2 diabetes. SDH activity is also markedly reduced in skeletal muscle cells of animals with experimentally induced or genetically encoded diabetes [11, 12]. Mitochondria of cardiomyocytes in rats with streptozotocin-induced diabetes show decreased oxygen consumption in comparison with healthy controls, resulting from reduced activity of complexes I and II. This mitochondrial dysfunction involved oxidative damage of the FAD-binding subunit of SDH, which could be reversed by insulin treatment . With regard to diabetes-induced alterations of mitochondrial enzymes in pancreatic islets, only limited data are available. A case report of a patient with mitochondrial diabetes has described a marked decrease in the number of beta cells accompanied by increased beta cell SDH staining in histological samples . MacDonald and colleagues observed reduced activity of mitochondrial glycerol phosphate dehydrogenase and pyruvate carboxylase in islets of Zucker diabetic fatty (ZDF) rats, whereas SDH activity appeared to be unchanged . Leibowitz et al  showed that for rat islets, SDH inhibition by 3-nitropropionic acid (3-NPA) or fumaric acid monoethyl ester (MEF) impaired insulin secretion by lowering gene transcription of preproinsulin and synthesis of proinsulin . As a structural analogue of succinate, 3-NPA covalently and irreversibly binds to the active site of the enzyme thereby preventing complex-II-mediated FADH2 generation . In neurological research, in which 3-NPA is widely used to damage dopaminergic neurons in animal models of HD or Parkinson’s disease [18, 19], it has been suggested that the mechanism underlying 3-NPA toxicity involves increased production of reactive oxygen species (ROS) . To elucidate the role of SDH in beta cell function and to uncover the mechanisms by which the enzyme interferes with stimulus-secretion coupling (SSC), we investigated the influence of 3-NPA and MEF on mitochondrial activity, cytosolic Ca2+ concentration ([Ca2+]c), insulin release and ROS generation. Islets of Langerhans or clusters of islet cells were isolated from adult C57Bl/6N mice (Janvier, Saint-Berthevin, France and Charles River, Sulzfeld, Germany). The principles of laboratory animal care were followed according to German laws. Isolation and culture were performed as described previously . Changes in the concentration of reduction equivalents were monitored by determination of FAD and NAD(P)H autofluorescence (465 nm and 360 nm excitation wavelength, respectively). Fluorescence emission was filtered (LP515 filter) and measured by a digital camera. FAD autofluorescence was corrected for photobleaching by subtraction of a double-exponential fit curve. Mitochondrial membrane potential (Δψ m) was recorded after loading the cells with rhodamine-123 (10 μg/ml, 15 min, 37°C). For quantification, data were normalised to maximal mitochondrial depolarisation induced by the uncoupler carbonyl cyanide 4-(trifluoromethoxy)phenylhydrazone (FCCP, 0.5 μmol/l). ROS accumulation was determined by oxidation of 2′,7′-dichlorodihydrofluorescein-diacetate (DCDHF-DA, 20 μmol/l, 15 min, 37°C). For determination of [Ca2+]c, cells were loaded with fura-2 acetoxymethylester (fura-2AM, 5 μmol/l, 30 min, 37°C). Fluorescence was excited at 480 nm (Δψ m and ROS) or 340 nm and 380 nm ([Ca2+]c), respectively. Fluorescence emission was filtered (LP515 filter) and measured by a digital camera. After preparation, islets were kept overnight in RPMI medium with 11.1 mmol/l glucose. Details for steady-state incubations have been described previously . Batches of five islets were incubated for 60 min at 37°C with the indicated substances. For perifusions, 50 islets were placed in a bath chamber and treated with 3 mmol/l glucose for 60 min prior to the experiment. Δψ m and [Ca2+]c were measured at 37°C in a solution of pH 7.4 containing (mmol/l): 140 NaCl, 5 KCl, 1.2 MgCl2, 2.5 CaCl2, 10 HEPES, and glucose as indicated. The medium for insulin secretion contained (mmol/l): 122 NaCl, 4.8 KCl, 2.5 CaCl2, 1.1 MgCl2 and 10 HEPES (pH 7.4). In the pre-incubation experiments, 3-NPA was added to the incubation buffer for 60 min. 3-NPA was removed during loading with fluorescence dyes. In the Ca2+ experiments (Fig. 4a–e), pre-incubation with 3-NPA was reduced to 45 min followed by 30 min loading with fura-2AM (without 3-NPA). The shortening of the pre-incubation period was intended to standardise Δψ m and [Ca2+]c experiments to a period of 75 min in buffer with 0.5 mmol/l glucose. RPMI 1640, fetal calf serum and penicillin/streptomycin were provided by Invitrogen (Karlsruhe, Germany). Fura-2AM was from Biotrend (Köln, Germany). All other chemicals were from Sigma-Aldrich (Taufkirchen, Germany), Roth (Karlsruhe, Germany) or Merck (Darmstadt, Germany). Data were collected from islets or islet cells of at least three different mice for each series of experiments. Values are given as means ± SEM. Autofluorescence data in Fig. 1a were averaged before and after the 3-NPA-induced incremental increase in FAD autofluorescence. In Fig. 1b–g, NAD(P)H and FAD autofluorescence was analysed by comparing the averaged data directly before elevating glucose concentration to the fluorescence values reached after 15 min in 15 mmol/l glucose. Evaluation procedures for Δψ m or [Ca2+]c are described in the respective figure legends. Statistical significance was assessed by ANOVA followed by the Student–Newman–Keuls post hoc test or by the Student’s t test. A value of p ≤ 0.05 was considered to be significant. In isolated beta cells stimulated with 15 mmol/l glucose, the specific SDH inhibitor 3-NPA  (1 mmol/l) irreversibly increased FAD autofluorescence, thereby indicating reduced FAD recycling via complex II (Fig. 1a). This elevation of FAD fluorescence was not prevented by dithioerythritol (DTE, 5 mmol/l), suggesting that blockade of SDH was not achieved by protein oxidation (elevation of FAD fluorescence was 18.1 ± 2.3 arbitrary fluorescence units (AU) [n = 14] with 3-NPA vs 18.1 ± 1.2 AU [n = 26] with 3-NPA and DTE, NS, data not shown). The effect of 3-NPA on FAD fluorescence was also tested with monomethyl succinate as substrate. Similar to the results obtained with glucose, the decrease in FAD fluorescence induced by methyl succinate (10 mmol/l) was countervailed by 3-NPA (n = 11; data not shown). In cells pretreated with 3-NPA, the reduction of FAD induced by elevating glucose concentration from 0.5 to 15 mmol/l was significantly less pronounced than in control experiments without SDH inhibition (Fig. 1b, c and the right columns in Fig. 1g). As another tool to reduce SDH activity, the monoethyl ester of the Krebs cycle intermediate fumarate was used. In the presence of MEF (10 mmol/l), the glucose-induced reduction of FAD fluorescence was abolished (Fig. 1d, g). Pre-incubation with 3-NPA had no effect on the glucose-mediated rise in NAD(P)H autofluorescence (Fig. 1e, f and the left columns in Fig. 1g). The influence of 3-NPA and MEF on the kinetics of insulin secretion was investigated by perifusion experiments. In agreement with the dose-dependent increase in FAD fluorescence with increasing concentrations of 3-NPA (Fig. 2a), insulin release decreased in response to rising concentrations of 3-NPA. Moderate inhibition of SDH by 0.1 mmol/l 3-NPA (Fig. 2b) or 5 mmol/l MEF (Fig. 2d) mainly affected the second phase of insulin release, whereas with increasing SDH inhibition (1 mmol/l 3-NPA, Fig. 2c) the first phase was also delayed and drastically reduced. Insulin release could be partly restored by the ATP-sensitive K+ channel (KATP channel) inhibitor gliclazide (10 μmol/l; Fig. 2e). Gliclazide had no effect on FAD autofluorescence (FAD fluorescence in 15 mmol/l glucose was 327 ± 10 AU, and with the addition of 10 μmol/l gliclazide it was 327 ± 10 AU [n = 9], NS, data not shown), which excludes any influence of gliclazide on FAD/FADH2 balance. To further elucidate the contribution of SDH to glucose-mediated insulin release, 3-NPA was tested with various glucose concentrations (Fig. 2f). 3-NPA had no effect on basal insulin release but decreased secretion stimulated by 8, 15 and 25 mmol/l glucose. With respect to FAD fluorescence, the acute effect of 1 mmol/l 3-NPA was similar in the presence of 15 and 25 mmol/l glucose (3-NPA-induced increase in FAD fluorescence: 14 ± 2 AU with 15 mmol/l glucose [n = 12] vs 9 ± 2 AU with 25 mmol/l glucose [n = 9], NS, data not shown). The effect of SDH inhibition on Δψ m was determined. Beta cells were stimulated by elevating glucose concentration from 0.5 to 15 mmol/l. This manoeuvre resulted in a hyperpolarisation of Δψ m, indicating activation of proton motive force and ATP production (Fig. 3a). In agreement with reduction of glucose-stimulated insulin release, the effect of glucose on Δψ m was significantly lower in beta cells pre-incubated with 3-NPA or treated with MEF than controls (Fig. 3a). To evaluate whether 3-NPA had an acute effect on Δψ m as observed for FAD the SDH inhibitor was applied to stimulated beta cells and changes in Δψ m were monitored. In this series of experiments, 3-NPA induced a depolarisation of Δψ m (Fig. 3b–e) that was independent of [Ca2+]c.
The results described above suggest that SDH inhibition results in less ATP generation. Consequently, 3-NPA should affect glucose-induced alterations in [Ca2+]c. To validate this hypothesis, beta cells were pre-incubated with 3-NPA. Thereafter glucose was elevated from 0.5 to 15 mmol/l and the time interval until [Ca2+]c started to rise was determined. In addition, the AUCCa was calculated for the first 10 min after increasing glucose concentration (marked as “tR” in Fig. 4a, b). These experiments showed that SDH inhibition by 3-NPA prolonged the response time of [Ca2+]c to 15 mmol/l glucose, thereby reducing the AUCCa (Fig. 4a–d). To test whether the decrease in [Ca2+]c is solely due to the lag in onset or also due to reduced Ca2+ influx during continuous stimulation, AUCCa was calculated for 5 min after the first rise in [Ca2+]c (Fig. 4e). This evaluation revealed that Ca2+ influx was significantly lower in 3-NPA treated vs control cells. The acute effect of 3-NPA on glucose-driven oscillations of [Ca2+]c was also determined. Addition of 3-NPA to glucose-stimulated beta cells terminated oscillations and reduced [Ca2+]c to basal values. The cells were still responsive to gliclazide (Fig. 4f). It has been suggested that interruption of respiratory chains at complex II leads to increased production of radicals due to incomplete electron transfer . We investigated whether activation of antioxidant defence mechanisms effectively counteracts the inhibition of insulin secretion caused by 3-NPA. The SOD mimetic TEMPOL (4-hydroxy-2,2,6,6-tetramethylpiperidine-1-oxyl; 1 mmol/l) and its mitochondrially targeted derivative mito-TEMPO ((2-(2,2,6,6-tetramethylpiperidin-1-oxyl-4-ylamino)-2-oxoethyl)triphenyl-phosphonium chloride; 10 μmol/l) [23, 24, 25] were applied during the steady-state incubation with 3-NPA. Neither drug protected against the impairment of glucose-stimulated insulin secretion (Fig. 5a, b). General upregulation of antioxidant enzymes by overnight incubation with the nuclear factor erythroid 2-related factor 2 (Nrf-2) activators oltipraz (10 μmol/l) and tert-butylhydroxyquinone (tBHQ, 30 μmol/l), or with the sulfonylurea gliclazide (10 μmol/l), which has also been reported to increase activity of antioxidant enzymes after long-term incubation , did not prevent the inhibitory effect of 3-NPA (Fig. 5c–e). Figure 5f clearly illustrates for oltipraz that the protocols used above efficiently protect against oxidative stress. For TEMPOL we have recently shown protection of islets against H2O2-mediated impairment of electrical activity and insulin secretion . To investigate whether SDH inhibition in beta cells is accompanied by changes in ROS, intracellular ROS accumulation was analysed by monitoring DCDHF oxidation. Beta cells were incubated with 15 mmol/l glucose or with 15 mmol/l glucose and 1 mmol/l 3-NPA. Interestingly, short-term inhibition (15 min) of SDH by 3-NPA had no effect on ROS accumulation (Fig. 6a). After a 60 min incubation period with 3-NPA, intracellular ROS even decreased by ~40% (Fig. 6b). For comparison, ROS accumulation in unstimulated beta cells was also determined in this series of experiments. The data indicate that blocking SDH largely prevents endogenous, glucose-stimulated ROS production. The co-action of cytosolic and mitochondrial enzymes involved in the generation of reduction equivalents and ATP is essential for pancreatic beta cells. During glycolysis, NADH is provided by substrate-level phosphorylation of glyceraldehyde-3-phosphate by glyceraldehyde-3-phosphate dehydrogenase (GAPDH). It has been shown that shuttling glycolytic NADH into the mitochondria is indispensable for glucose-mediated SSC . In the TCA cycle, substrate turnover generates NAD(P)H, and SDH regulates formation of FADH2. Consequently, impairment of mitochondrial enzymes is expected to affect the SSC of beta cells. However, as experiments inhibiting activity of the TCA cycle are not well correlated to changes in glucose-mediated insulin secretion [27, 28], the significance of the different enzymatic steps for regulation of insulin release is still unclear. 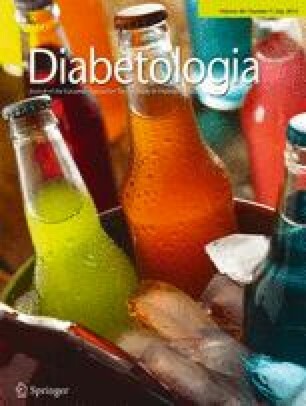 Here, we show that inhibition of SDH by 3-NPA or MEF markedly reduces glucose-stimulated insulin secretion. Kinetic measurements reveal inhibition of both phases of insulin release with the second phase of insulin secretion being affected first by reduced FADH2 supply. The effect of 3-NPA was largely prevented by the sulfonylurea gliclazide, emphasising that impairment of SSC upstream to KATP channel closure is the main mechanism for 3-NPA toxicity. To what extent modulation of SDH activity influences development of type 2 diabetes remains to be elucidated by further studies. To further investigate how SDH inhibition interferes with SSC of beta cells we analysed glucose-induced alterations of [Ca2+]c. 3-NPA retarded the glucose-mediated elevation of [Ca2+]c. In addition, once started, Ca2+ influx was significantly lower in 3-NPA-pre-incubated beta cells than in untreated controls. In astrocytes, short-term application of 3-NPA steadily increased [Ca2+]c . Consequently, we tested whether acute addition of 3-NPA affects the typical oscillatory pattern of [Ca2+]c occurring during continuous stimulation with glucose. We observed a reduction of [Ca2+]c to basal values (Fig. 4f), supporting our hypothesis that inhibition of SDH reduces ATP synthesis. Subsequent opening of KATP channels leads to an interruption of the SSC. In agreement with the data obtained for insulin secretion, acute application of gliclazide effectively counteracted the influence of 3-NPA on [Ca2+]c.
To characterise the effect of SDH inhibition on mitochondrial function, we analysed FADH2, NAD(P)H and Δψ m. As expected, FAD autofluorescence was irreversibly increased by 3-NPA. Importantly, a glucose-stimulated decrease in FAD fluorescence (which is indicative of an increase in FADH2 concentration) was largely absent in beta cells pretreated with 3-NPA and in cells treated with MEF. By contrast, the lack of effect of SDH inhibition on glucose-mediated changes in NAD(P)H is astonishing as NADH generating steps of the Krebs cycle should be affected by blocking SDH. However, one must keep in mind that fluorescence-optical determination of NAD(P)H covers several processes (Krebs cycle, glycolysis and rate of respiration). Obviously, these pathways balance each other without any consequence on the net effect. The question arising from these results is whether altered FAD/FADH2 balance without any changes in NAD(P)H is sufficient to influence mitochondrial ATP synthesis. In neurons it was reported that inhibition of SDH by 3-NPA reduced ATP by ~25% within the following 2 h. This effect was not accompanied by apoptosis, indicating that the drop in ATP concentration resulted from impaired cell function and not from loss of cell mass . In our experiments, changes in Δψ m were determined and taken as a measure of altered activity of mitochondrial respiratory chains. Our data show that SDH inhibition drastically reduces the ability of glucose to hyperpolarise Δψ m (Fig. 3a). Compared with the effects observed by Leibowitz et al , who tested 3-NPA in rat islets and observed complete inhibition of glucose-induced hyperpolarisation of Δψ m, the effect of 3-NPA was less pronounced in our experiments. This discrepancy might be due to the experimental design: we switched between 15 and 0.5 mmol/l glucose whereas Leibowitz et al  compared the effect of 3-NPA on Δψ m at 16.7 and 3 mmol/l glucose (levels at which respiratory chains are already partly activated). To further analyse how 3-NPA influences Δψ m, we tested whether 3-NPA-induced inhibition of mitochondrial respiratory chains requires Ca2+ influx. In experiments performed in the presence of an L-type Ca2+ channel blocker, we observed a gradual depolarisation of Δψ m, indicating Ca2+-independent action of 3-NPA on mitochondria. Elevated ROS levels in response to 3-NPA have been reported for different cells [20, 31] and isolated mitochondria . Bacsi and colleagues  demonstrated that the influence of 3-NPA on ROS critically depends on the cell type: while 3-NPA augmented intracellular ROS in cell lines of alveolar epithelial cells and parenchymal liver cells it was ineffective in macrophages. For pheochromocytoma cells, it has been shown that short-term application of 3-NPA induces a concentration-dependent elevation of ROS , whereas others did not detect any effect in the same cell line . As oxidative stress plays an important role in beta cell failure during development and progression of type 2 diabetes , we monitored ROS accumulation. Our data demonstrate that 3-NPA had no acute effect on intracellular ROS and even reduced ROS concentration after an exposure time of 1 h (Fig. 6). In line with this result, the rise in FAD (which is indicative of SDH inhibition by 3-NPA) was not prevented by the thiol-group reducing agent DTE. The fact that different antioxidant strategies could not prevent the inhibitory effect of 3-NPA on insulin release is also in agreement with a mechanism that does not involve elevated ROS levels. There is increasing evidence that a certain amount of ROS is necessary to maintain the physiologic function of pancreatic islets. Low concentrations of H2O2 have been shown to augment insulin release of unstimulated islets. Moreover, the increase in ROS coinciding with glucose stimulation seems to be a prerequisite for adequate secretion . Interestingly, a 1 h application of 3-NPA completely prevented glucose-mediated ROS elevation. At present, we do not know the extent to which the elimination of glucose-triggered ROS production contributes to the inhibitory effect of 3-NPA on insulin release; however, it is tempting to speculate that in addition to decreased ATP production, the omission of other signalling factors (such as mitochondrially derived H2O2) takes part in this scenario. In summary, our data demonstrate that inhibition of SDH is sufficient to drastically weaken the efficiency of glucose to hyperpolarise beta cell mitochondria. The resulting decrease in ATP synthesis interrupts SSC, and consequently reduces insulin secretion. We thank M. Arning (University of Münster, Münster, Germany) and I. Breuning (University of Tübingen, Tübingen, Germany) for skilful technical assistance. The work was supported by grants from the Deutsche Forschungsgemeinschaft (GD and MD). AE, PSM, CB and SU acquired and analysed data and revised the manuscript. PKD analysed data, revised the manuscript and contributed to discussion. GD designed the concept, revised the manuscript and contributed to discussion. MD designed the concept, acquired and analysed data and wrote the manuscript. All authors approved the manuscript. MD is responsible for the integrity of the work as a whole.